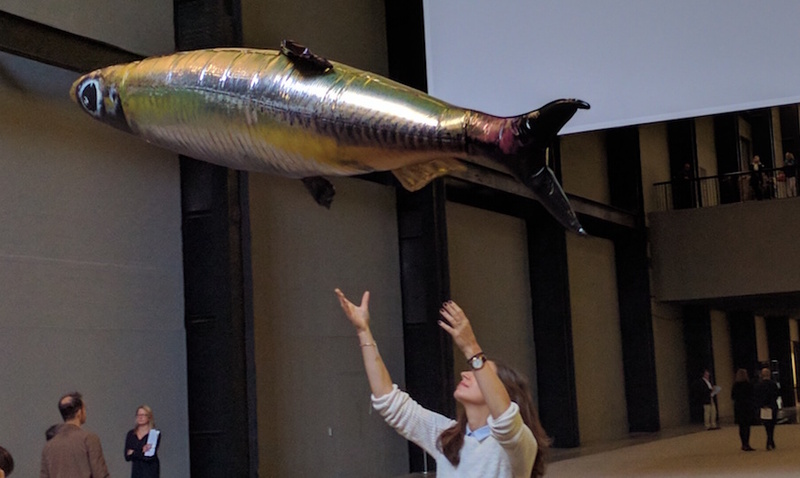 Throw a fish into the air and watch it float around the turbine hall. Tate Modern's Turbine Hall is a fantastic space for interactive art, whether it be basking in a giant sun by Olafur Eliasson, crunching on Ai Weiwei’s sunflower seeds or, most recently, watching London soil sprout plant life in the last Turbine Hall commission by Abraham Cruzvilegas. The latest installation by Philippe Parreno is wonderfully surreal. Large inflatable fish float up, down and around the Turbine Hall making visitors feel like they’re inside a giant fish tank. Visitors can pick them up when they hit the floor and launch them to fly around the space in a seemingly random fashion. Each one has a different weighting so some come back down fairly quickly while others are suspended in the air for minutes at a time. That’s just one aspect of the work. Noises are pumped into the hall, from the sound of rain pounding on a roof to the wail of police sirens. Microphones will be placed outside the Tate with these sounds piped in as well. Speakers descend and a film appears on the screen. The speakers, acoustic panel and a screen playing a film descend from the ceiling and in front of visitors in sequence. Lights and sounds come and go as you spend time in the Turbine Hall — it’s a particularly unnerving experience to lie on the carpet as the panels descend towards you, and the sound of rain intensifies. The sequencing cannot be predicted as a bio-reactor filled with micro-organisms play a part in how the work progresses, meaning that each person’s experience will be unique, and people can happily spend minutes or hours soaking in the experience. 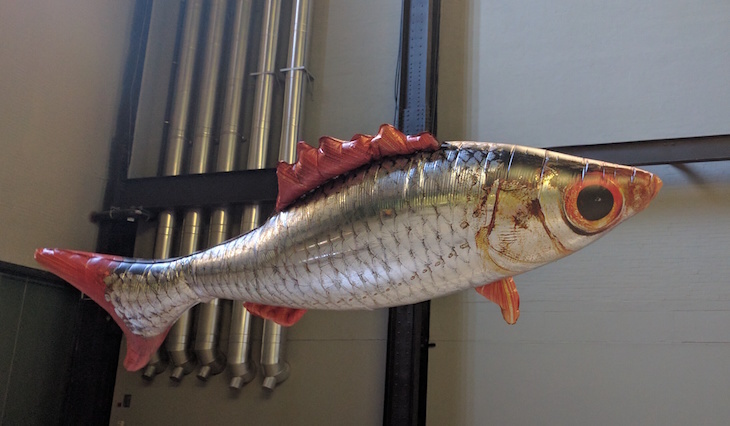 The Turbine Hall commission's strength lies in creating engaging experiences, and in this instance Philippe Parreno has nailed it. Hyundai Commission 2016 - Philippe Parreno: Anywhen is on at Tate Modern Turbine Hall until 2 April 2017. Entrance to the Tate Modern is free.